Our fully restored 1860s farmhouse features wide plank floors, original hand-hewn beams, and various shades of chestnut, pine, and oak for guests looking for the traditional warmth and feel of a bed and breakfast. The house features a large shared dining area, small parlor, kitchen with vaulted wood ceiling, and French doors that lead out to our covered front porch with ample seating and magnificent lake views. 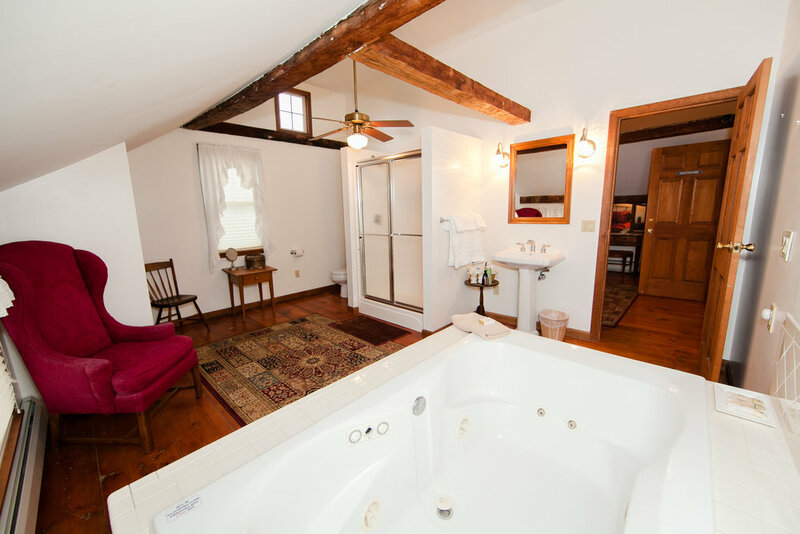 With four charming rooms to choose from – each with their own private bath – guests can enjoy antique furnishings, cozy reading areas, and the comfort of years gone by. Located on the 1st floor, our Fireside Room can accommodate up to 4 guests*. This room features original wide-plank wood floors, two non-working century-old hearths, a queen bedroom, private in-room bath with large whirlpool tub and hand-held shower (no stand up shower), and french doors that lead to a comfortable sitting room, complete with a convertible queen sleeper sofa foldout and reading chair. Just outside the suite is an exterior doorway to the expansive covered porch overlooking beautiful Seneca Lake. Located on the 2nd floor, our Southlake Room can accommodate up to 2 guests. This spacious room features a king-size bed, reading chair, antique dressing table, and original wide-plank floors. Impressive hand-hewn beams frame the high ceilings and charming wall lamps call for relaxation with a novel and cup of tea. The room adjoins with a massive 180 sq. 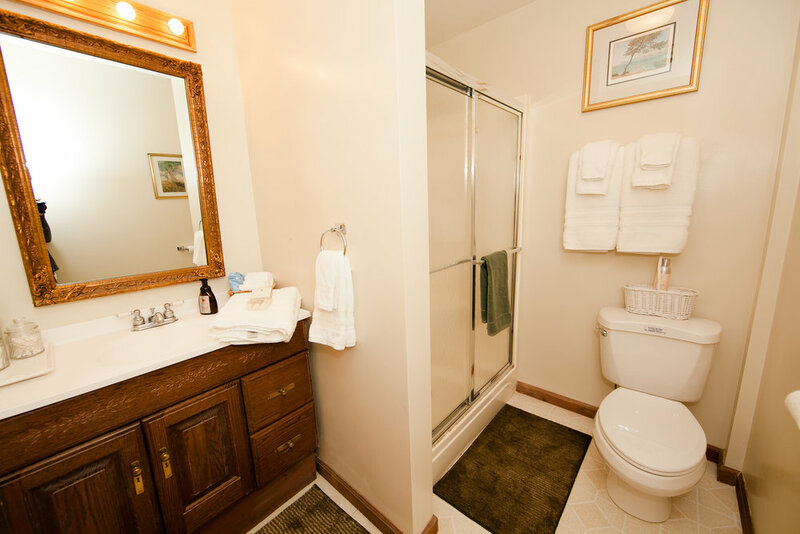 ft. private in-room bath with a large Jaccuzi tub and separate shower with seat. Southern and western-facing windows and skylights provide ample natural lighting in both the room and bath. Located on the 2nd floor, our Mapleview Room can accommodate up to 2 guests. This cozy queen bedroom, located on the second floor of the Inn, features a reading chair, an antique dressing table, and wide-plank wood floors that are original to the house. 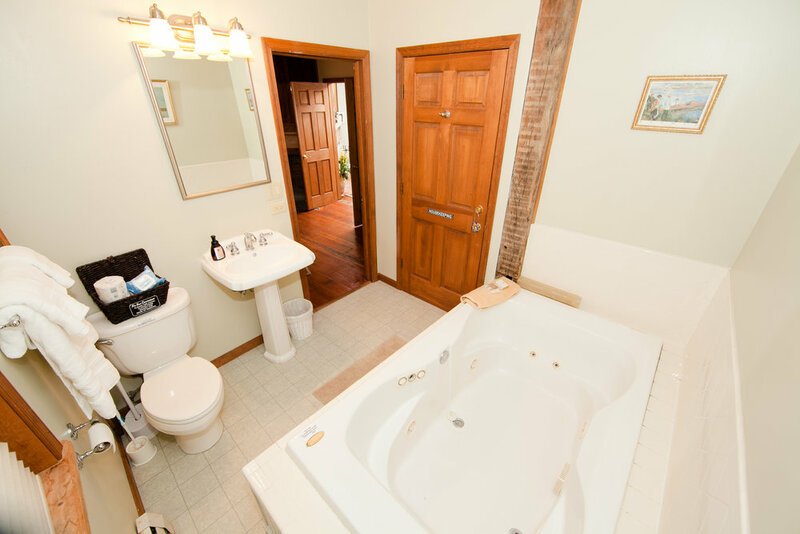 The bedroom opens into a spacious private bath with a large jacuzzi tub and separate shower with seat. Original, hand-hewn beams frame the bedroom ceiling, while natural lighting is provided by a west-facing skylight and a small pocket window from which you can view the lake. Located on the 2nd floor, our Sunset Room can accommodate up to 4 guests* and can be rented as a one-bedroom king or two-bedroom king and queen suite. This large 2-bedroom suite offers a private first-floor entrance and stair. You will enter directly into the queen bedroom, which features a reading chair, desk, and two north-facing windows for natural lighting. Continue through the queen bedroom to a small connecting corridor – to the left is the private en-suite shared bath with shower and to the right is the entry to the main king bedroom. The spacious, bright King room's large picture window provides the best lake view on the property, which can be enjoyed from the comfort of the antique four-poster canopy bed or reading chair.